Engineering specialist that outfits firearm shooting ranges and tactical mock-ups with proprietary protection materials under the “Searls” trademark. Operates in a niche area with a 16-year track record, good reputation and expertise. Potential beneficiary of sizeable SG-AU joint military development and SAFTI City projects, according to management. Strategic partnership with Swiss Securitas Group helps broaden service offerings and penetrate the European market. We recently met with Starburst, an engineering group specialising in the design and engineering of defence training facilities. Armed with a 16-year track record and strong technical know-how, the company operates in a niche area of the highly opaque, strictly regulated defence industry, which elevates the barriers to entry for new players. Starburst sees itself as a proxy to higher military spending in Southeast Asia and Middle East, underpinned by rising tensions and continual terrorism threats. Management expectations of stronger contract wins and better profitability did not materialise post-IPO in 2014, given recorded net profit of S$13.2m. A slight delay in rollout of military projects, coupled with cost overruns from the Marina One architectural steel project, led to FY15-16 net losses for Starburst. While its earnings tend to fluctuate due to the ad-hoc nature of projects and varying intensity at each phase, management seeks to build up its recurring income via more maintenance service contracts. a 10-year, S$900m development of SAFTI City. The company reckons it is well-placed to secure both contracts, with 10-20% possible share of each contract value. Starburst also announced a strategic partnership with Swiss Securitas Group, a global security consultant and solutions provider. This partnership involves Swiss Securitas Group taking a 5.1% equity stake in the listed entity, while Starburst will acquire its subsidiary, Swiss Securitas Asia, for S$0.6m in exchange. Management sees this as synergistic to its service offering, as well as providing a gateway to the European market. Starburst’s 1Q17 core net profit of S$0.5m and gross margin of 55.8% were a vast improvement from the 1Q16 core net loss of S$0.4m and 23.8% gross margin. Notwithstanding the high working capital requirements of the business, the company had a low net gearing ratio of 5.3% as at end-1Q17. Disposal of its old factory in 1Q17 for S$7m, together with the 2016 warrants issuance, could further strengthen its cash position for larger-scale projects and M&A opportunities, according to management. The company consistently rewarded shareholders with dividends in FY14-16 (implied dividend yields of 0.7-3.4%), even during the loss-making years. It currently trades at 2.6x historical P/BV, a 30% discount to the global industry average. 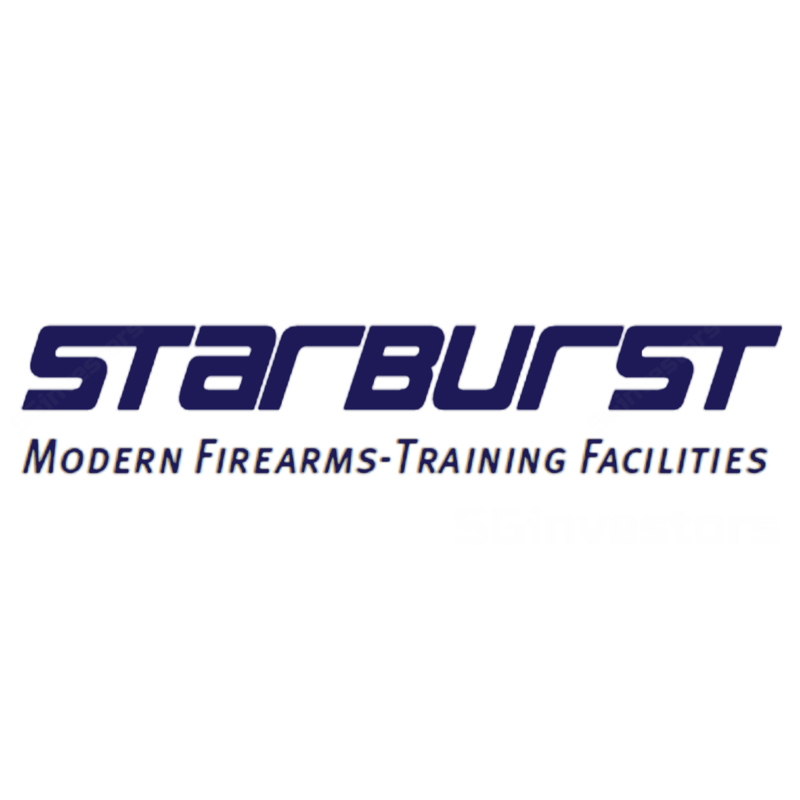 Established in 1999 and listed on SGX Catalist since Jul 2014, Starburst Holdings (“Starburst”) is a Singapore-based defence contractor specialising in the design, fabrication and maintenance of anti-ricochet ballistic protection systems for firearm shooting ranges and tactical training mock-ups in Southeast Asia. As a niche player in the industry, Starburst provides specialist contract services to other defence contractors, whose clientele includes law enforcement, military and security agencies. Starburst develops and supplies its proprietary line of anti-ricochet ballistic protection materials under the “Searls” trademark. The materials are manufactured from recycled rubber tires and plastics by different original equipment manufacturers (OEMs) while design and specifications are done inhouse by Starburst prior to the manufacturing. the more recurring maintenance services and others segment. The Southeast-Asia region accounted for 54% of Starburst’s FY16 revenue, while the remaining 46% stemmed from the Middle East region. Such geographical sales mix tends to change year to year as the bulk of contracts are awarded on an ad-hoc basis. The firearm shooting range business segment refers to the design, fabrication and installation of firearm shooting ranges for military and law enforcement organisations. Its ranges include indoor and outdoor ranges, modular live-firing ranges, close quarter battle houses and method-of-entry training facilities. a hard surface behind the rubber separated by some space. The penetrating bullet is slowed by the dense rubber before fragmenting against the hard surface so any fragment that ricochets will be trapped within the dense rubber. Lastly, the maintenance services and others segment relates to the provision of maintenance services for completed firearm shooting ranges and tactical training mock-ups. This segment also includes the design and supply of steel struts and steel beams. The business generated from this segment is recurring as Starburst typically secures the maintenance contract for the firearm ranges that it outfits. Most firearm ranges have a 1-year warranty period after construction and maintenance of these projects will only contribute to revenues after this period. Based on numbers from the Stockholm International Peace Research Institute (SIPRI), an independent resource on global security, global military spending rose 0.4% in 2016 to US$1.7tr. With escalating political tensions and ongoing terrorism threats, demand for defence and military equipment is projected to increase by 3.2% in 2017F, according to the 2016 Defense Markets Report – International Trade Administration. Defence spending in the region, particularly Indonesia, the Philippines and Vietnam, is also forecasted to grow and contribute to Asia’s expected US$533bn in defence expenditures by 2020F. Management believes that the company could be a prime beneficiary of growing defence equipment and infrastructure spending worldwide, given its established track record, good brand and specialty in modern firearms-training facilities. On 13 Oct 2016, Singapore and Australia signed the first set of agreements under the Comprehensive Strategic Partnership (CSP). Under the defence initiatives, Singapore and Australia will jointly develop military training areas and advanced facilities in the Shoalwater Bay Training Area and Townsville Field Training Area, which will be approximately 10 times the size of Singapore. Based on an official release by Singapore’s Ministry of Defence (MINDEF), these training facilities will require an investment amount of up to AU$2.25bn (S$2.35bn) for the life-cycle costs over 25 years. Nearer to home, MINDEF also announced on 3 Mar 2017 that there will be a new training ground located in western Singapore. This 88ha area, also known as the Singapore Armed Forces Training Institute (SAFTI City), will replicate dense urban environment to allow soldiers to hone their urban-fighting skills in real life settings, such as high-rise buildings, basement carparks, bus interchange and a MRT station. According to MINDEF, SAFTI City will cost about S$900m, and to be completed in 10 years. With a new factory (fully operational in 2016) that is thrice the size of the old factory, it avails greater capacity for Starburst to take on fabrication works that are of larger scale and greater complexity, according to management. Apart from the few sizeable contracts which Starburst is pursuing, the company also recently announced a strategic partnership with Swiss Securitas Group, to complement its existing capabilities with homeland security services and security engineering solutions. While Swiss Securitas Group will be purchasing 10m vendor shares and 6m warrants from the two controlling shareholders, (representing about 5.1% equity stake in Starburst based on the enlarged share capital, assuming full exercise of the warrants), Starburst will acquire Swiss Securitas Asia (FY16: S$0.08m net loss) for S$0.6m. Swiss Securitas Group is a family-owned security company in Switzerland, which has more than 11,000 employees worldwide and provides a comprehensive range of security services and alarm & security system solutions. Swiss Securitas Asia, the technology arm of Swiss Securitas Group in Asia, counts Credit Suisse AG Singapore, IO Data Centre, Global Foundries and SMRT Train Ltd as some of its customers. This collaboration not only broadens Starburst’s service offering, but also opens up a gateway for the company into Europe, according to management. Starburst operates in the defence industry, specifically in a segment known as the engineering and construction of training facilities (ECTF). The company is known for outfitting firearm ranges with its anti-ricochet ballistic protection linings using its proprietary line of protection materials under the “Searls” trademark, usually as a specialist contractor to main contractors. Cubic Range Design Solutions (CUB US, Not rated) is a US-based specialist in the design and construction of training facilities and training systems. It designs shooting ranges and supplies target equipment as well as systems software. The company also serves Asia-Pacific clients from its Singapore office. Microcircuit Systems Ptd Ltd is a Singapore-based firm that specialises in the design and engineering of targetry and simulation systems. Meggitt Training Systems (MGGT LN, Not rated) is a UK-based company that specialises in the supply of integrated live-fire and simulation weapons training systems. Meggitt also specialises in the design and construction of indoor, outdoor and modular ranges. In the years leading to its IPO, Starburst had overall gross margins averaging 40-50% and 30-40% net margins. However, a series of project delays and cost overruns (particularly from the Marina One architectural steel project at Marina Way) made a great dent on Starburst’s FY15-16 financials, after a record-high FY14 of S$13.2m net profit. In 1Q17, the company recorded a core net profit of S$0.5m and gross margin improvement to 55.8%, vs. 1Q16’s core net loss of S$0.4m and gross margin of 23.8%, possibly a sign of turnaround in FY17, according to management, due to tighter cost management. We note that revenue recognition and gross margins could differ on a quarterly basis depending on the phases of each project, as fabrication work is typically more intensive and of higher value-add than installation work. Management targets to raise the sales contribution of maintenance services to provide a more recurrent income stream. The high working capital requirements for Starburst’s business arise from the progressive billings of contracts, based on the stage of completion for the work carried out. While in the past a substantial 60-70% of contract value is billed upon fabrication and the remaining at installation phase, management now seeks to improve its working capital management by billing 5-10% at design phase. Despite the working capital-intensive business, the company maintains low net gearing of 5.3% as of end-1Q17, and further cash proceeds of S$7m from the completed disposal of its old factory on 10 Mar 2017. Starburst has also been consistently paying dividends over FY14-16 with dividend yields of 0.7-3.4%, even during the loss-making years. Management believes the issuance of 62.5m warrants in May 2016 (at the issue price of S$0.01 each) could help raise additional funds for the company upon exercise (at strike price of S$0.25/share within a 5-year validity period). This improved cash position could help facilitate strategic business opportunities, paring down of borrowings and general working capital purposes, according to Starburst's SGX announcements. Starburst currently trades at FY16 P/BV of 2.6x, a 30% discount to peers’ average of 3.8x (excluding outliers), based on Bloomberg consensus estimates. While it currently trades above its IPO price of S$0.31/share, Starburst's share price is still a far cry from its historical peak of S$0.76/share in Aug 2014.